Yesterday was the day we left Nice for Grenoble. Sadly, Chintan and I didn't make our train reservations until yesterday morning. Consequently, the afternoon train was sold out and we were forced to take the 5pm train. 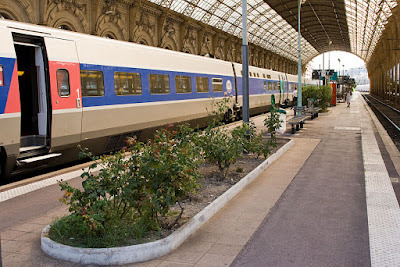 We also didn't realize that it would be a 7 hour ride (5 hours to Lyon, 40 minute wait, 1 hr 20 minutes to Grenoble). Hence it was extremely late by the time we got to our hotel in Grenoble. One upside is that we did get to spend more time in Nice. We had the chance to have a relaxed lunch, visit a photography museum, get an ice cream from a store with 90+ flavours and get a drink before catching the train. Technical Specs: Canon Rebel XTi, 24-105 @ 24mm, f/8, 1/50s, ISO 200.